Perfect for his special brunch, Dad will love this sweet and savory French Toast. 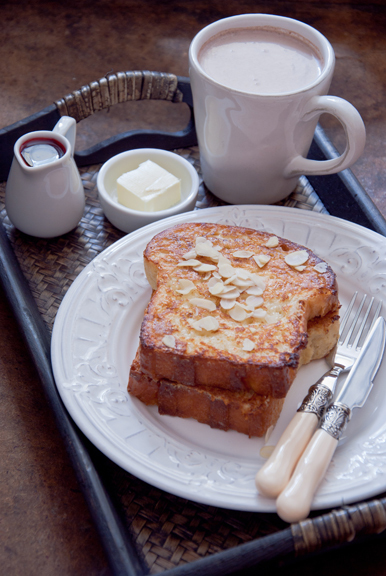 Our combination of a touch of bourbon in the French toast, the crunchy toasted almonds, and a buttery bourbon maple syrup make this a spectacular brunch dish. Just add some smoky bacon and Dad’s favorite juice to complete the meal! Add the maple syrup and the butter to a medium saucepan and bring to a simmer. Remove from the heat. Stir in the salt and bourbon. Keep warm while you make the French Toast. Heat the oven to 350 degrees. Place the almonds on a parchment-lined sheet tray and toast in the oven for 7-8 minutes until lightly browned and fragrant. Remove from the oven and set aside to cool. (Be sure to leave the oven on once you have removed the almonds. You need it for the French Toast) In a bowl, whisk the cream, eggs, salt, sugar, bourbon, cinnamon, and vanilla bean paste until well combined; pour ½ of the mixture into shallow dish. Heat 1 tablespoon of butter in a 12″ skillet over medium heat. Soak half the slices of Brioche bread in the egg mixture for about 30 seconds per side. Transfer the bread slices to the skillet and let each piece cook for about 3 minutes per side. Checking the bottom occasionally to make sure your French toast doesn’t get too dark. Place the cooked French Toast into the oven on a parchment lined sheet pan. Heat another tablespoon of butter in the sauté pan, soak the rest of the bread slices for 30 seconds per side and cook the balance of the French Toast same as above. When finished place the balance of the French Toast into the oven with the other pieces and let bake for an additional 10 minutes.